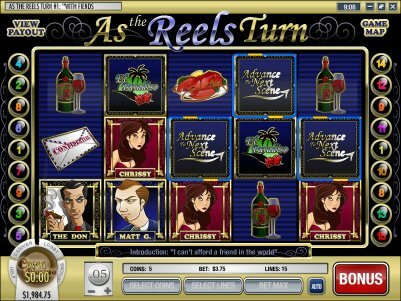 Overview: As the Reels Turn is a five reel slot with a story - the more you play the more of the story you see. 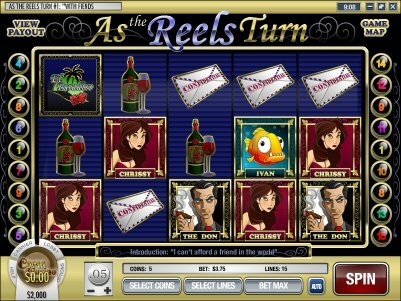 There are four Scatter Icons in As the Reels Turn: The Tommy Wong Icon, Ivan the Fish Icon, Bonus Icon and the Advance to Next Scene Icon. 3 or more of these Icons will need to appear anywhere on the five Reels to trigger their Bonus Round. The Icons do not have to appear on any single payline. 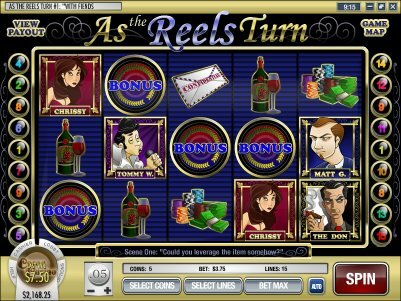 Tommy Wong Bonus Round: If 3 or more Tommy Wong Icons appear on any of the 5 Reels, including paylines that are not enabled, you will enter the Tommy Wong Bonus Round. In the Tommy Wong bonus round you must choose a Tommy Wong character that you think the audience will like the most. 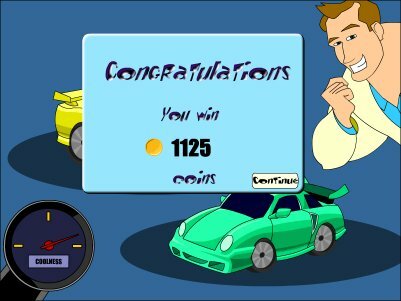 Terry's Car Bonus Round: Terry's Car Bonus Round will be triggered after the second cut-scene is viewed as shown in the Game Map. In this Bonus Round you must choose which car you think Terry will like the most. 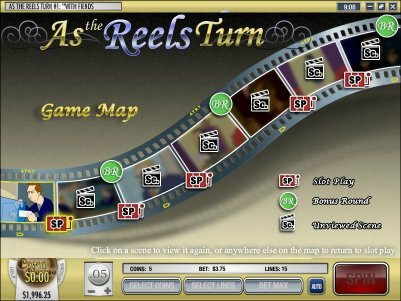 Slot Machine Bonus Round: The Slot Machine Bonus Round will be triggered after the 4th cut-scene is viewed as shown in the Game Map. 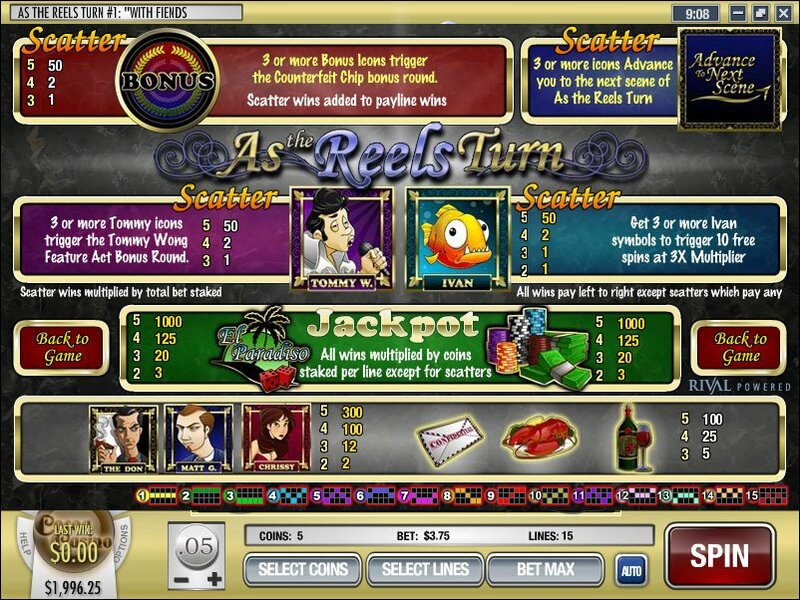 In this Bonus Round you must click on the different Slot Machines until you click on the one that is out of money. The values of the winning Slot Machines will accumulate for a final payout. 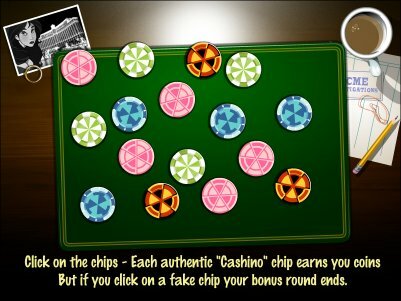 Similar Slots: If you like As the Reels Turn, you might like these other Rival-powered i-slots: Cosmic Quest: Episode 2 - Mystery Planets, Cosmic Quest: Mission Control, Fixer Upper, Japan-O-Rama, Sherwood Forest Fortunes, The Back Nine.